THE VASE Magnificent and extremely rare, "Louis XVI ". 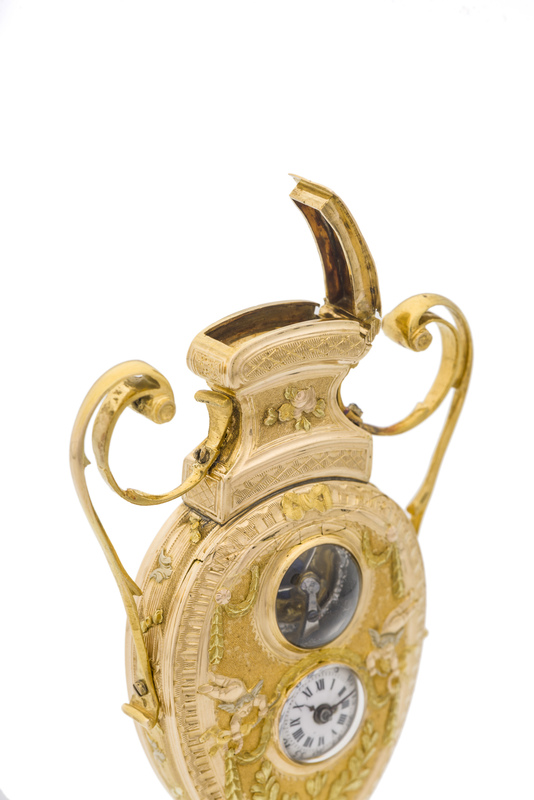 Geneva, gold, double-face, watch, in the form of a Neoclassical vase with two handles, with visible balance, date, compass and two concealed compartment, one for a vinaigrette with a mirror, the other for the key. Dimensions 99 x 55 mm. Signature The box stamped ''P G'' probably for Placide Granier. Galerie Neumarkt, Zürich (Switzerland), auction, October 8, 1971. This watch-object can be linked by its decoration to a small group of Genevan pieces of neoclassical inspiration of a great facture bearing sometimes the mark "P G" of a goldsmith master who can be Placide Granier. 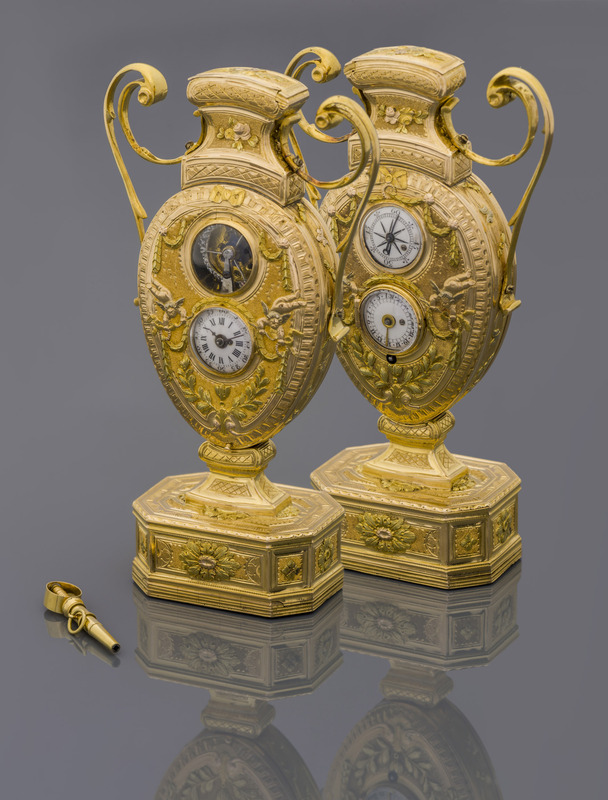 The Patek Philippe Museum in Geneva, as well as the Louvre Museum and the Cognacq Jay Museum in Paris, as well as various private collections, kept in their collections several of these magnificent timepieces, some in the form of miniature lanterns (with three dials), double-side miniature cartels (with two dials), canes handle, boîtes à montres (with two or three dials), perfume bottles (with two or three dials), "World Time" bonbonnière (with one dial), but also various boxes without watches (snuff-boxes, bonbonnières), etc. 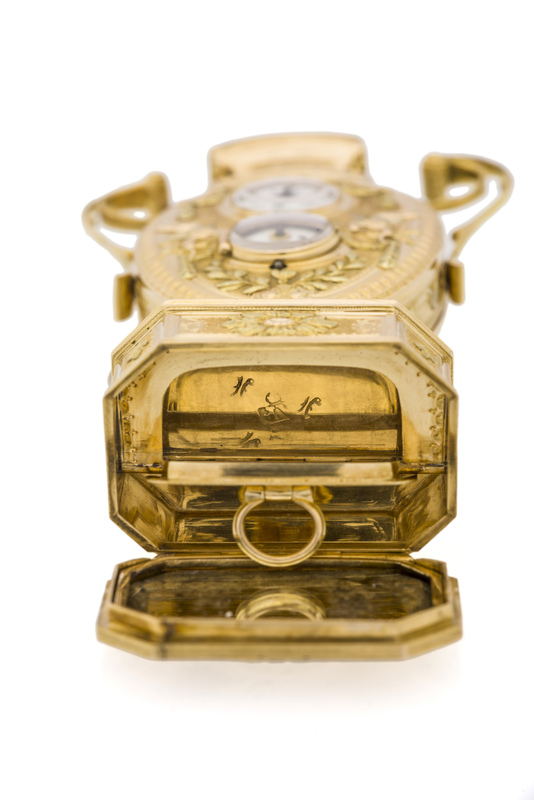 We found sometimes on these objects the signatures of Parisian watchmakers and retailers, such as Pierre Morand, Adam L'Echopié (master received in 1758), etc. Placide Granier, Geneva (active between 1784 and 1812) Born in Cambrai in the North of France circa 1743, he died in Geneva on April 25, 1812. In this city he married Anne André (1745-1814), a lady probably from the long line of goldsmiths and painters on enamel. He was admitted, though simple domicilié (domiciled), to the privilege of the master's degree in Geneva on December 28, 1784 (which proves its great abilities! ), having presented as a masterpiece "une boîte garnie de diamants très bien faîte'' (a box set with diamonds, very well made). He was received as a habitant (resident) of that city on July 6, 1791, and Master goldsmith the following August 2. He associated with Jean-Georges Vignier (1769-1833), Master jeweller (received on August 27, 1791).